The film “Cave of Forgotten Dreams” (2011), by the German director Werner Herzog, portrays the singular opportunity to shoot in a 32,000 years old cave of the Prehistoric man. The cave was only recently discovered in southern France. It is so fragile that only authorized researchers are allowed to enter. The frescoes in the cave are spectacular and mesmerizing: horses, bulls and other animals are vividly living in the beautiful darkness. Herzog chronicles them in 3D through a slow exposure of the relationship between them and the researchers. The film dives slowly to the melancholy of the cave and the viewer’s mind: it describes how the fascinating images inside the cave become rich in their details the more we go deeper into the cave and along with it into our souls. The researches themselves testify that every time they come out of the cave they are unable to be released from the haunting images of the cave and they yearn to return inside – sometimes just hours after they have left the darkness. Generally speaking, this metaphorical depth of the “cave of thoughts” is a constitutive motif in western culture. 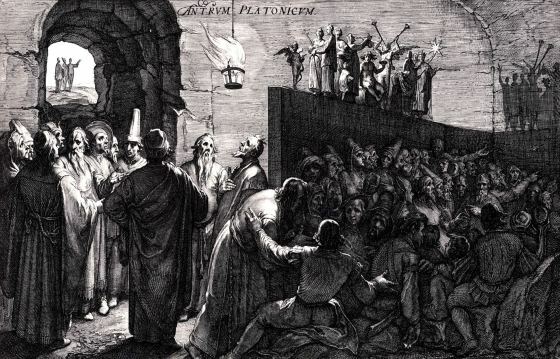 The allegory of the cave by Plato is one of the most quoted phrases of this metaphor. 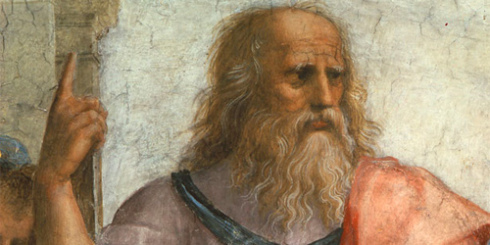 The allegory of the Cave is one of the most influential texts in the history of philosophy and thought in general. In fact, the shadows of the things around us accompany our lives almost every day. We meet people and talk, consume art in various forms and the experience remains as shadows deep in our minds. They play a kind of dance game – often vivid and consuming but not always accurate in comparison to the original experience. Like our fellow prehistoric man, we reserve our best cave images or thoughts to the depths of our soul. Those shadows are carved into our souls and stay with us for years. Other images vanish and leave only a pale sign at the entrance to our cave of thoughts. Like the allegory of Plato’s cave, we are prisoners watching the shadow images on our cave walls. Plato also argues that, unfortunately, we are prisoners of our minds and we do not need a philosopher to teach us about the true sunlight outside. Many scholars have written about Plato’s cave and here we will briefly present it. The allegory of the cave is an educational allegory about prisoners chained in a cave since childhood. They are tightly chained so they do not change their position at all – even their heads. The entrance path to the cave is long and narrow and a fire is burning at the end of it. Behind the chained prisoners things passes through and their shadows fall on the cave’s walls. In this way, the prisoners are condemned to see the shadows on interior wall without realizing their source, the fire. The cave prisoners are like spectators in a shadow theater but they believe these shadows are reality itself. One of the prisoners who represent the figure of the philosopher breaks his chains and goes out of the cave to see the sunshine. He returns to the cave to tell his fellow prisoners what he saw. However, the prisoners do not welcome the liberated with love: They do not even want to listen and venture to kill him. The Tarot card number 13 is traditionally called in different cultures “The Card with No Name” but sometimes the image of death is mistakenly attributed to him . 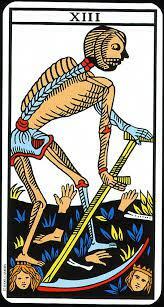 Thus,the card’s meaning is not death but a state of fundamental change we are going through. In this context, the image of the skeleton figure may represent the prisoner from Plato’s cave which was released from his fetters. As the liberated prisoner, the skeleton has shed all his skin, i.e, his former life. The skeleton wishes to revolutionize his life on the, he realizes that this is the end of an illusion according to which he spent his life so far. This change can be defined as a radical change “to the flesh and bone” – literally and figuratively speaking. The prisoner or the skeleton undergo a metamorphosis: his mind transforms from seeing the shadows and speculating according to his senses that these things are real – to the direct intellectual observation of the sun and the true knowledge of things themselves. The bottom section of the card, which contains mostly the black earth, may represent the cave and its prisoners. This is a fruitful comparison: we see the skeleton’s yellow scythe which yellow color symbolizes cognition and knowledge. Thus, he is like the released prisoner seeking his way up in the of Plato’s cave. He is leaving behind two figure heads; they are the prisoners who are still in it. Like Plato, who is not specific about the identity of the prisoners in his cave, the card implies that kings and perhaps even our parents may be among the cave dwellers. Quite clearly we see that the heads of the prisoners in the card’s cave turn their eyes from the golden grass that may represent the fire burning in the cave. In fact, these characters are looking at us and they seem to be telling us about their spiritual decadence. In this way, we and the figures in the card share the same fate. Similar to the liberated prisoner in Plato’s cave, the skeleton wants to restore his social contacts with the people he left behind. He wants to show them his new yellow scythe or the new knowledge he has acquired, but they do not even look at him. Beyond the fact that he is ignored, one may ask what does the future holds for the philosopher in the cave ? Does he is destined to be presumed as an “intellectual skeleton” while the prisoners disregard his knowledge? These questions continue to accompany Plato’s “Republic”; however, they take an interesting turn in the Indonesian shadow theater called “Wayang Kulit”. One can find it fascinating that parallel ideas bridge the geo-cultural distance between this ancient theater and the Greek cave. In fact, Wayang offers an interesting alternative ending to the allegory of the cave. The Wayang Kulit draws its inspiration from the Hindu scripture stories. Itadds to those scriptures elements from classical drama like the hero/villain conflict, comedy and even parody. The theater puppets are made ​​from leather of buffalo and are stuck on bamboo sticks. The Shadow of the dolls is displayed on a white screen. The master puppeteer Indonesian name is “Dalang”. The dalang is not just a puppeteer; he is the mediator between the spectator and the divine. Hours before the show, the dalang meets with his future viewers and hears about their troubles. The show will contain clues for possible solutions for these troubles, often in the form of the good against the bad theme. Before the show, the dalang lights his oil lamp, talks to the dolls like they were humans in all respects, sits cross-legged before the white screen, and the orchestra, the Gamelan, begins to play. Soon after, with the start of the show approaching, the dalang burns some incense and prays to the gods to protect him. The actual show is continued throughout the night until dawn and always adopts its themes, as mentioned above, from the Indian Mahabharata and Ramayana. 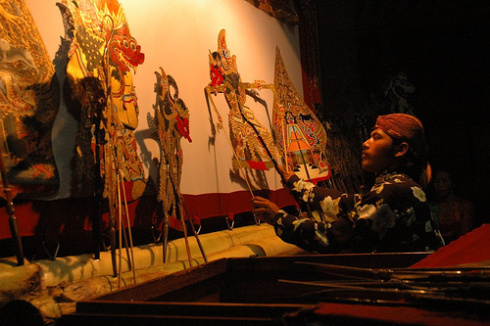 The dalang is governing the puppets with both hands while tapping on a wooden box. He changes his voice tone depending on the figure: sometimes his voice was like soothing melted chocolate and sometimes it is like a thunder storm. He laughs whispers, shouts, groans, mocks. Each puppet figure has its gestures and manner of speech. An average performance consists of 80 shadow puppets. The bulk part of the show is spoken in a language the villagers don’t understand – the Kawi. However, this does not bother the spectators who know the stories and characters by heart. Just in case, the dalang recruits a local clown who presents the basics of the story in the local language or dialect. The dalang, just like our cave’s prisoner- philosopher, aims to entertain his audience – he strives to be understood. This is a most difficult profession – much more than just convincing the prisoners to escape their cave. The dalang must remember long religious texts and simultaneously keep the collective tradition intact and improvise in a creative manner. Thus, the dalang is not like the gloomy cave’s philosopher – he is a philosopher and an artist in one act. In every performance he must regain the balance between these kingdoms. In fact, the dalang is a prisoner in Plato’s cave but not a regular one: he is the prisoner-philosopher that is not bound with chains. He chose to stay in the cave and view the shadows in his artistic and creative wisdoms. The Waiang Theater tells us that we should strive to be like the dalang, that is, to re-experience our inner shadows and not just watch them passively. It might not get us out of the cave but we could ascended beyond our human condition and create our own walls. 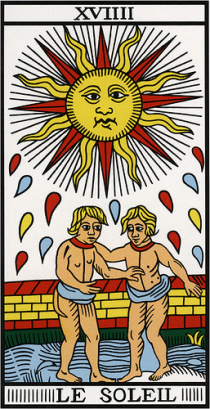 The Tarot card “The Sun” describes the arrival of the released prisoner-philosopher to the cave. The boy on the right had just discovered the sun, the good. Until now, he bathed in the wise ray-lights of his cosmic father and now he wants to share his knowledge with the boy on the left. However, the boy on the left has a little tail which signifies that the animal sensory impulses still control him. He wants to achieve the happiness of knowledge but will not give up his tail so effortlessly. We see it in his gestures: while the boy on the right is trying to help and trust her hands on the shoulders of his fellow, the boy on the left hand is reaching to his fellow stomach. We can only speculate that they maybe share a collective consciousness but we can also imagine that the boy on the left is trying to reach his fellow heart and limbs. Like Wayang Kulit’s atmosphere, the card is telling us that one must strive to reach solidarity in order to be understood by your fellow people. However, the road to knowledge of the common good for all of us is not easy: we may encounter the beast inside us. The Sun card, the card without a name, The Allegory of the Cave, Werner Herzog and theater of Waiang will guide us in our journey.